Time for another 5 things post! 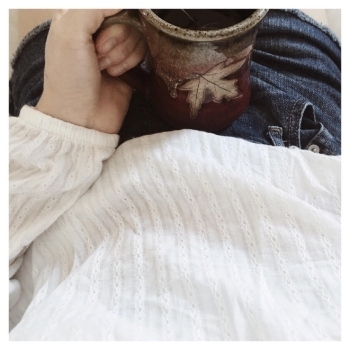 I hope this inspires you to get cozy and stay present as you enter into the holiday season! JJ Heller’s “I Dream of You Volume II,” has been on repeat in our house. It’s basically lullabies for adults (best idea ever). It’s the perfect mix of calming and cheerful, so you should definitely check it out on Spotify or wherever you tune in. If you’re in the camp of, “It’s November and therefore I only listen to Christmas music from now on (I get you). We’re also loving Brian Crain’s “A Traditional Christmas,” which is instrumental renditions of classic carols. So soothing and beautiful. Have you ever tried coconut butter? It’s made from grinding the coconut meat, rather than just extracting the oils. This means you get maximum nutrients, vitamins, and minerals from the whole fruit. It also boosts immunity and kill bacteria and viruses. And on top of all that….it’s DELICIOUS, smooth, creamy, and sweet. Yum. Currently my favorite ways to eat coconut butter are blending it into hot coffee or hot cocoa, drizzling it on a banana, or using it to make homemade peppermint chocolate patties (I was inspired by this recipe, and posted how I made them on my IG). *tip: If the coconut butter is too hard to stir, put the jar in a bowl of warm water and it’ll soften right up so you can stir before eating it. If you know me, you know my heat pad, because it comes with me often. Microwaveable heat pads are usually filled with rice or beans (making it important to not over-heat lest you create an enchilada). They’re preferable over electric pads because they’re gentler on your skin and body. Heat pads are great for putting in bed with you on cold nights, laying across your lap as you wait for the car to warm up, or laying across your back or stomach if you’re experiencing any pain or discomfort. You can find them on Etsy, or if you have a mamma like mine who sews, they’re pretty easy to make! I got these for Christmas last year and they are still my absolute favorite slippers . A lot of the Pottery Barn slippers are on sale, so if they don’t have your size or style preference, keep checking back on the website because I bet they’re about to restock for holiday shopping! I love how plush they make their material, and the soft sole makes them light to wear, easy to throw in the washing machine, and so cozy! I recently read this article about the Danish concept of Hygge (pronounced hoo-gah). It’s “The art of creating intimacy” --intimacy in your home, with a friend, or alone with your surroundings. It’s a feeling of cosiness, contentment, simplicity, kinship, and comfort, cultivated through consciously enjoying the present. It’s not something to do or buy, but rather an extension of the natural beauty of your life through simple acts of ritual, turning the ordinary into extraordinary. Hygge is experienced through simple acts like sipping coffee from your favorite mug, grabbing a cozy blanket and calling a friend, or delighting in the colors of produce sprawled out on your counter. So here’s to a season of Hygge, friend - of rituals that create presence, comfort, simplicity, and kinship. What makes you feel cozy? Share in the comments below, I’d love to hear!